Yesterday’s Irish Open Semi-Final got off to a decent start. With direct buy-ins, forty players were in the competition, and the prize pool had seven tickets to the final (which was set to begin two hours after the start of the semi-final). A4 was the hand of the day. I made my first two wins with 4♠A♣ and 4♦A♦ before a T♦Q♥ popped me up to more than twice the 3K starting stack. Then I took my first hit from an A♠4♠ that turned into a 5-high straight flush. I had a dry card spell for a while and slipped back down to near the starting stack until things kicked into gear just before the break at the end of the first hour, with blinds at 50/100. I had a sketchy J♣8♣ but called a raise of 200 from UTG+1. The big blind called and there were three of us to a J♠T♣3♥ flop. Action checked to me in the cutoff seat and I bet 300 with both other players calling. 7♠ showed up on the turn, giving me top pair and a gut-shot straight draw. I put out another 300. The big blind called but UTG+1 gave up. The 8♠ hit on the river. I had two pair but there was a potential flush on the board. I had 2,800 chips, covering the stack in the big blind by about 900. He went all-in and I called, and I was glad a 9 hadn’t showed because he had K♣Q♣ for an open-end straight draw. That was all he had, though so my two pair cleaned him out. Ten minutes later, after the break, I got the Mutant Jack: A♠J♠. Blinds were at 75/150 and I raised to 300 from UTG+1, leaving 7,500 behind. The button, with about 6.150, re-raised to 1,050 and both the blinds folded, leaving me heads-up. I called. The flop was a somewhat worrying J♣9♣9♦ and I checked. The button put out nearly half his stack as a bet and I raised him all-in, seeing it as an attempt to push me off. He called and showed T♣T♥, giving me a one-better two pair. The 7♣ on the turn was very unwelcome, whaat with 12.5K in the pot, but the river Q♠ meant I was up to more than 14K, or 11.6% of the chips in play in the tournament. More on that later. Another bluff attempt gave me my next bump in another ten minutes. I was dealt A♥7♥ in the small blind, at the 100/200 level. The only caller was UTG and when action got to me I raised to 400. The big blind folded, but UTG called and I was rewarded with a flop of 6♥4♥J♥. I wanted to try to get as many chips out of this as I could and checked. So did UTG. The 3♠ showed on the turn, which gave straight possibilities to anyone playing some low hands. I tapped the gas with a bet of 400, which was called. The flop was a somewhat unwelcome 5♥, which made it possible that my ace-high flush could be beaten by someone holding 2♥3♥ for a 6-high straight flush, but that’s pretty unlikely (although I saw a straight flush the other day). Since I had the 7♥ he couldn’t be straight flushing the other direction. I put out 1,000, figuring that he’d fold. Much to my surprise, he raised to 4,800. He either had the straight flush or a good fifth heart or a lot of bluff. I knew I had the best regular flush and took the chance he hadn’t bet out 400 on 2♥3♥. I raised all-in (I probably should have just called, he had me covered by several thousand) and he folded. Eventually I was up to nearly 20K in chips with just under 1/6 of the chips in the tournament. I was the chip leader (and I’d been the chip leader for a period earlier, as well). I should have been satisfied. With seven tickets to the final, the average stack at the end of play would have about 17K. All I had to do was make safe bets to stay in the mid-teens—or in all likelihood, just fold—for the rest of the tournament. But what time was it? It was hand 130, or close enough. On hand 120, I picked up K♦A♠. Great hand, much of the time but did I really need the chips? There were only seven at the table at 125/250/20. I was in the hijack seat and UTG+1 raised to 625. Me with my big, manly AK raised to 1,000. Everyone but the original raiser folded. A Q♥6♥A♦ flops and he, impressed by my magnificence checks, as do I. An 8♣ turns up, he checks and I bet 1,000, which is called. A 2♥ shows on the river and he pretends to have a flush, betting 2,775. I call. Not only does he have a flush but at best I would have been splitting the pot because he’s got A♥K♥. Bad, sure but recoverable. I still have nearly 15K in chips. I’m still in the top three in the tournament. Five minutes later we’re still in the same level. I’m holding K♠Q♥ in UTG+1 and raise to 500. The hijack (with 6K in chips) and big blind (8K) both call. The flop falls 7♠2♣K♥ and I bet 500 when it’s my turn. Hijack raises to 2,000 and the big blind folds. The hijack only has 3,333 behind and I raise him all-in. Lucky him, because he’s holding K♣A♠. No queen shows up to save me and I’m down to 8.5K and in seventh place on the leaderboard, which means unless I can climb back up I’m probably out of the running for a finals ticket. That was hand 129. Of course, my attempts to climb back up only submerge me further. The Mutant Jack fails me at one point to the tune of several thousands chips, dropping me below the starting stack. I manage to claw my way back into relevance with a Q♣A♣ and 9♦6♦ (which I wouldn’t usually play except I was in the big blind. My last big hand came down to me in the small blind with A♥7♣ and the big blind with A♣J♥. The board was 5♣4♥K♥ K♦ 8♠ and it was the jack that decided the outcome. After that it was just a couple more hands before I was out in tenth place with the smallest of the cash prizes. As it was, we didn’t finish before the beginning of the Final. My elimination came tw0-and-a-half hours into the tournament and anyone who got a ticket to the final would have had to enter after that point. Nobody from our semi-final seems to have won either of the two packages awarded in the final. The chart below shows my chip count throughout the 179 hands I played. The green line is the projection of my chips if I’d done nothing but fold after reaching the my peak, which would have been about 13,750 at hand 180. At the time I was eliminated—with just two more eliminations to go before the tournament was over—only three of the ten players had more than 14,000 chips. Chip count chart for Irish Open Semi-Final 30 January 2011. Red line shows actual chips; green line shows projected chip stack based on folding only. The Irish Open Quarter-Final starts in 15 and there are 26 players registered after all of the eligible quarter-finals have played. Four tickets to the final, with a fifth if someone else pays up to join. How could I have forgotten? During the $5K guarantee KO game I was dealt 9♣9♥ in the small blind (15/30). I was the second-largest chip stack at the table, with about 4,500. Four of the six others were between 570 and 1,900. Short-stacked UTG went all-in for 570, the button called (leaving 1,070 behind), and I called. The flop was 6♦K♦9♠. Pocket kings had me beat, but I wasn’t too worried. I thought I’d see how far the button was willing to go on his own, and checked. The button checked and the turn card was 6♠. Now pocket 6s also had me but I went all-in for almost 4K. I guess the button didn’t think I had much. He called. Then the 9♦ showed up on the river. When the cards went over, the small stack had K♣T♦ for a higher two pair than the T♥A♣ of the bigger stack, but neither beat my two pairs of nines. Two bounties and 3,880 chips. Somehow I missed two whole days, but in the meantime I managed to cash for small amounts several times. Things didn’t start off well, however, with a $3K guarantee Cake R&A game on Wednesday evening. My biggest pot ever was in a $5 re-buy (in which I did not re-buy) but generally I try to avoid both re-buying and playing in re-buy tournaments. I never managed to get my poker legs, re-bought twice, but even the add-on couldn’t save me. I entered a $1K turbo tournament at the 75/150 level with 1,500 chips, gained a little ground, then managed to double up with K♥K♣. Then I almost lost it all and things were looking grim with less than 1,000 chips at 200/400/40 until I managed to arrest the tailspin and get up over 8K, then settle down to about 5K at 400/800/75. By the 600/1200/120 level I’d been whittled down to 2K when my A♣J♥ ran into A♦Q♥ on my all-in and I went out in 21st place of 181, with 81% ROI. A $1K turbo 6-max put me out on hand 23 when I called the all-in of a K♣J♣ with A♦K♦. Naturally, the jack paired on the turn. A bounty tournament with a $1K guarantee was the last game on Cake in this series. The only bounty I saw was the one I generated, though. Blinds were 75/150 and UTG+1 had limped in. I raised to 550 from UTG+2 with A♠Q♠. Action folded back around to UTG+1, who went all-in for 3,875, more than my 2,617. I called and was just a little behind his 5♣5♠. Two spades hit the board but the pair held up and I was out. Late Thursday night I moved over to Full Tilt and played the $36K Rush Guarantee which was about 20 minutes in. It’s both re-buy and multi-entry but I didn’t do either and was felted after about half an hour when my K♦J♠ came one card short of drawing to a king-high straight to beat a pair of kings. Last night it was back to Midnight Madness. It was a slow and steady climb without any real setbacks from the starting stack of 1,500. I think the one real mistake I made was my final hand, calling a larger all-in with J♦T♦ which had served me well earlier in the tournament. With 15K and blinds at only 250/500/50, I could have given up the $1K bet I’d made, then made a deeper run than 560th and better ROI than 23%. Despite not having had the best of luck playing simultaneous tables in the past, for most of Midnight Madness I was also participating in a $5K guarantee KO game, with a $0.50 bounty for each player. I don’t know if I was less inclined to take fliers of dodgy hands because I had two games going or if I was just playing well or lucky, but I hit the money here as well. This game was a bit less even than Midnight Madness. I did take in six bounties but at one point I lost more than 6K in the space of five hands with A♦K♦ and A♣K♠ (picking up 9,400 with A♥J♦ over A♣Q♣ did sort of make up for that). I lost half a 23K stack with Q♠T♠ when my queen paired on the board but so did that of a player with A♦Q♦. I managed to get up to 36K by the time the blinds were 500/1,000/125, then lost a chunk when my A♣T♥ paired the top card on a T♦5♥8♠ flop but lost to pocket Q♠Q♣. Nothing connected after that and it was A♣J♦ running into K♥A♦ that put me out with four hearts on the board—6♥2♥A♥ Q♥ 2♣—and a flush for the better hand. 226th place and my bounties was good for an ROI of 184%. Tomorrow morning is the weekly Irish Open semi-final qualifier. Only about twenty people registered so far and at least three tickets to the monthly final, which is in the early afternoon and will have more than thirty folks chasing a single $7K prize package plus about $3,850 in cash for second through fourth place. Just a couple of uneventful and unprofitable games last night, both lasting about two-thirds of an hour, after the previous day’s flurry. A shot at Midnight Madness petered out after some calls with decent hands failed to connect and I had to abandon ship. At the end, an ace-high flush draw died without issue and I was out in 2,357th place (Full Tilt’s new multi-entry thing is wreaking havoc on place calculations). A $5K guarantee tournament right afterward didn’t go anywhere either. We started at 2,000 chips and I never broke above 2,600. No post yesterday does not mean that there was no poker played. This is what I’ve done since the last post. Got into a 3FPP Hyper-Turbo Steps Special for an NAPT ticket. You only start off with 500 chips. Second hand in I get K♣K♠ and call an all in. Two more callers makes it me versus: 9♠A♣, 7♠A♠, and 9♥9♣. The board rolls out T♣2♦Q♠ J♠ 5♠ and I’m gone. $15K 6-max guarantee on Full Tilt and I’m cruising along with a couple hundred above the starting stack of 3K. I’ve got T♠J♥ and paired the board with the jack. There’s a Q♥ on the flop. I pushed the first bet and called 500 on the turn which was just a 7♦. There’s 1,500 in the pot when the K♠ shows on the river and my 120 bet is met with a raise to 1,860. I could call it but fold and the guy shows his 8♦9♥ for nothing better than a busted nine-high gut-shot straight. Grrrrr. I lose another 1,000 to see the flop with a pair of sevens a little later but the fold’s a good one. I make it back on the next hand but three hands later I push too hard with J♣Q♣ and I’m down to 5 chips. I manage to make it up to 45 before elimination. Another 6-max, this time with $8K guarantee. It was actually doing quite well with a Q♣K♥ giving me an ace-high straight on hand 5 and netting a couple thousand chips. Another five hands and J♠9♣ turned into a full house, putting me at nearly three times the starting stack. Pairs of tens and queens had me over 11K half an hour into play and in the top 20 chip stacks. Ten minutes later, I was over 13K with K♥A♠. I took my hits with the blinds and lost a couple of hands with decent cards but was over 10K when I called a cutoff bet of 566 with 9♣8♣ from the small blind (100/200, with only five seated at the table and the button calling). Three of us to the flop and I got a straight right away, with T♦6♣7♠. First to act, I bet 1,500. Cutoff had me covered by about 4K and called, with the button folding. 7♣ shows on the turn; I’ve got a flush draw in addition to my straight and I bet 1,600 but I should really have pushed. The cutoff calls. Then 7♥ shows on the river. I check and my heart sinks when the cutoff bets 4K. I call, he’s got the T♠ for a full house, and I’m down to 2,360, which goes all-in on the next hand with A♦Q♥ and loses. The midnight game yesterday morning had 2,200 players and $4,400 in guarantees. I was in the big blind for 40 chips (out of 2,000 to start) on hand 7. The hijack—who was up 1,200 chips—bet 80 after action folded to him. The cutoff folded. The button raised to 160 and the small blind three-bet to 240. I called with my T♣T♦. Hijack called. Button went all-in for 1,790. Ten things got real crazy when the small blind called. I called, leaving 260 behind. Hijack got out, probably wondering what the hell was going on. The flop was 7♥4♣8♣ which meant nothing to me. The small blind put out a bet large enough to get me al-in to call. In for 1,790, in for another 260 I always say. The turn was the T♣. After a 3♠ showed on the river, I saw that I was up against Q♥Q♠ (button) and A♠A♦ (big blind]. I tripled up but a couple of subsequent losses brought be down to 687 a dozen hands later. An hour into the tournament, I’d managed to built back up to 7K. Blinds were at 350/700/85 and a stack half my size made an all-in move. I had A♠J♣ and called but the cutoff—with a stack twice my size went in for enough to put me all-in. I called and was fine against the smaller stack’s A♣3♣ but seriously in trouble with the big stack’s J♦J♠. Nothing bigger than a nine showed on the board and I was out 50 places short of the money. The first of my attempts at yesterday’s Irish Open quarter-finals had a slow start but a third of the way in a pair of sevens miscalculated against my A♦J♦. The turn and river put three nines on the board giving him a full house, but the J♠ on the flop gave me a better one and I doubled up from the starting stack of 2K. A♦6♦ in my hand earned another 2.5K with a flush just past the first hour of play. Then a pocket pair of sevens worked in my favor with a 7♣ on the flop and I was up to 8K and the chip lead shortly thereafter. There were enough players in the tournament that there were three tickets to the semi-finals as well as cash prizes for the next four spots. I managed to stay in contention for the tickets until a little past the 90-minute mark (125/250/20) when I raised to 625 with T♠T♥ from the hijack position and was met with an all-in for a little less than I had from the big blind. I should have been thinking “position maintenance” but called instead to see A♦Q♠, leaving me with 350 behind. An A♥ on the turn mostly sealed my fate. I say “mostly” because I’m never one to say give up and die at the poker table. I doubled up with J♦K♠ four hands later and did it again three hands after that with J♦Q♥ (where were these cards when I needed them before?) Eight hands after my lowest point of 290 chips I had increased that by more than 1,100% to 3,645 and I was in contention for fourth place out of seven remaining players (the top three stacks were between 10.6K and 16.4K). I played fairly tight from here on out, never managing to get above 5K but never falling below 3K. I took out one player with a small number of ships, another player fell victim to the blinds, and the last of the other small stacks tried to make a move with Q♥4♥ and was beat by king high. My own move came with an A♣8♠ that I tried to rep a flush to a big stack with on a 5♦2♣K♣ 4♠ 7♣ board, but since he had 2♥K♦ and four times more chips than I had, that didn’t work too well. I got my buy-in and another $8.50. 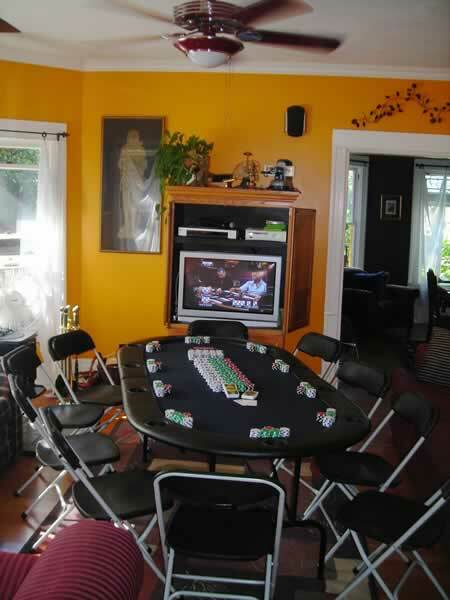 The Catsino was up and operating last night for the 17th regular game of our home league, although turnout was light. It was not operating well for myself or K, the POY leaders going into the night. I bled chips left and right, having to rebuy fairly early (only once, though). K rebought a bit later. I only made it to round 7 when I went up against W, who was short on chips, thinking he was trying to make a move. I only had A6o but thought I had him. I was right, too, until his A4o caught a 4 on the river and I was down to just a few hundred chips. He took those soon enough. K went out in the next round. I’m still point leader but I do mean point leader because it’s only by one. D’s almost caught up to me (although he had me tied a couple months back and I managed to pull away again) and he’s moved back ahead of Kent. We were talking before the game began about the WSOP schedule, because the agreement is that the POY goes to play in one of the $1K events at this year’s series. Apparently it was released yesterday afternoon, so now we need to finalize the league schedule and final date. The first of the possible events is 4 June. After I got the Catsino operation put away, I entered the 11PM Irish Open quarter-final. These late contests are a little harder because there aren’t as many entrants—particularly on Cake Poker—so they either get cancelled or there’s only one ticket. I suffered an early setback when my K♥2♠ was out-kicked on a juicy 8♥K♣8♦7♠7♦ board by K♦9♥. I worked my way back up to the starting stack and then to 2,400 within about 10 minutes. By the 75-minute mark—about 130 hands in—I’d made it to 10,000 chips, playing very conservatively. We were already down to four players and I was the chip leader, with the other three at 7,300, 4,100, and 600, and blinds at 75/150. Despite my best efforts and a couple of premium hands (particularly so for short-handed play) I lost a couple of pots and slipped to second place. Then one of the smaller stacks took a big chunk out of the top man and I was back on the throne. The same player shortly eliminated the other short stack and had about as many chips as I did. I managed to keep myself over about 7K through the 90-minute mark (hand 170), although I was back in second place. I was on the button when I picked up K♣K♠ and raised to 1,000 (with blinds at 100/200). The small blind (with the smallest stack) folded and I got a call from the big blind. The flop was J♠K♦Q♣ and the big blind was first to act with a bet of 1,000. An AT or even T9 had me, but I re-raised to 4,000 and got a call. The turn card was 6♠. The big blind’s bet of 400 was pretty inconsequential compared to the 10,100 in the pot already, so I called. The 6♦ on the river put me in mind of the hand that beat my straight in the $8K game, but I’m the one with the full house this time. My last 1,865 go in and he folds. I’m up to 12.565 chips, with the other players at 5,545 and 3,590. Five hands later and I’ve eliminated the small stack and I’m sitting on 17K. The remaining player and I are swapping blinds and making test bets. No time to be complacent; there’s almost nothing in the prize pool beyond the ticket for the first-place finisher. I suffer a setback with A♣5♣ when it runs into 6♥6♦. I call his all-in, hoping to take him out after 25 hands of heads-up, but all I get is a pair of nines on and a busted wheel draw on the board, so now he’s the chip leader by almost 2K. At one point he has a lead of nearly 3,000 but a lucky river draw of a queen gives me queens and twos to beat his pair of sixes on hand 218, bringing me back within 1K of his stack. I’m back in the lead (by 130 chips) on hand 223, then he’s on top the next hand. Hand 229 drops J♥J♣ on me, with the button. I call the big blind and he pushes to 11,040. That’s got me covered by 120, less than a small blind. When I call he flips over 8♦8♠. A J♠ is the first card on the flop, and while there’s three hearts and a K♠A♥, too, it’s all mine. 21,880. The next hand puts him all-in for the ante and small blind. I mate a T and he does a 2 but that’s the end of it. The semi-final is Sunday morning, followed by the Final (for those who make it). Tomer reports that he busted out of Day 1 of EPT Deauxville earlier today. Not much poker yesterday, just a couple of (very) brief excursions into tournaments. First off was The Ferguson with $2.7K in guarantees. I took a couple of early hits with a suited connector and a gapper, then managed to double up with 5♣5♥. A J♠A♣ made top pair on the flop but lost to tripped-up pocket 8s, putting me back on the street after 15 minutes. A Rush tournament with nearly $11K in guarantee money was very good to me early on. I entered (1,500 starting stack) half an hour into the tournament while the blinds were still only 40/80. My third hand, T♦A♣, the cutoff bet 240, I called from the small blind, and the big blind went all in for 1,500. The cutoff called and so did I. Cutoff’s hand was 4♥4♠; big blind had 9♠A♦. Things looked grim on the flop—9♦A♠A♥— but T♠ on the turn meant I was at least chopping the pot. It was J♦. I was a little short of the full call from the previous hand’s big blind, so the other ace holder got 160 from the pot but I nabbed 4,260 which put me up in the top 40 or so right off the bat. Sixteen hands later—which in Rush Poker means four minutes—I drew T♠T♥. I didn’t push things, just putting out a 300 bet at the 50/100 level. The small blind had a similarly-sized stack and went all-in for 3,590. I had it covered by only 375 but called. He was holding Q♠A♦ so I had a slight edge until the flop showed T♣J♥6♥, which gave me a much better edge. He got an A♠ on the turn for a bit of excitement but the river was J♠, giving me a full house. My undoing came less than two minutes (eight hands) later with another pocket pair. There was a limp (still at 50/100), then a bet and a call of 400 ahead of me. I was in the small blind with J♦J♥ and called; with another 7K behind I had everyone covered. The big blind folded and the limper called. The flop was 4♣T♥2♣. I bet 600, the limper folded, the original raiser went all-in for 6,200 and got a call of 2K from the other caller. This is where—in the interests of preserving my high ranking on the tournament leader board—I probably should have folded. But I called. The original raiser had K♦K♣ but the small-stack caller had T♠T♣ for a set. I had two cards hoping for redemption from the turn or river. A K♥ showed up on the turn and I was screwed. The 6♠ ruined the small stack’s thin chance of quads and the kings took in a pot of 16K. I had 851, which didn’t last long in Rush. A couple of disappointing results at live games tonight. In the early evening played in a charity tournament at the University of Portland, invited by B from my home league. B’s tween son was playing at the table I started at, as was W, also from the home league. Nobody from our table had busted out yet, although a few players out of the starting field of 38 had either rebought or left. No cash prizes but a five-day stay at a Mexican resort had been donated as one of the prizes. Our eight-handed table had one player who’d just about gone bust, a stack to his left who had a bunch of chips, and a couple of players like myself who had gone up and down from the starting stack of 5K. I picked up an A9o and pushed the action up to 400 chips from the big blind of 100. W, two seats to my left, pushed it to 800, and the big stack three seats to my right raised to 1,200. I made it 2,400 and W dropped out, leaving me heads-up with the big stack. He went all-in, and had me amply covered. Pocket queens. I had a chance until the flop showed another queen. No ace showed up. It wouldn’t have mattered if I’d had aces pre-flop. W mentioned that he’d folded AQ, which just ground the salt in more. I’ll have to deal with him next week. Played the 10PM at Aces Players Club. I was holding my own and even up from the starting stack of 5K a bit when I got A♦K♦ and started pushing. The player to my left had a stack just slightly larger than mine and we ended up all-in before the flop. Naturally he had aces. I came a card away from an ace-high spade flush, but went out before an hour was done. A busy day (for me) at the virtual tables yesterday. I started off in a morning turbo game that had over $34K in guarantees. I took a big hit on hand 7 laying down Q♥Q♣ after an ace and a king showed on the flop and turn respectively and a doubled-up stack bet big. I only lasted five more hands. Didn’t do much better in the $5K guarantee I entered next after calling a short-stack’s all-in with Q♦K♦ halved me. It was a coin toss but I never recovered. Entered a couple of freerolls without getting very far; ditto with a couple more EPT Steps Special tournaments. The last of those was extra-short. With 200 of 1,000 chips in pre-flop and Q♦Q♣ in my hand, I bet 300 on a flop of 7♦9♣6♥ and the only caller goes all-in. I call and he’s got T♥A♦ and a 28% chance of winning, which he does when 8♥ shows up on the turn giving him a straight. An 8♣ on the river rubs it in just a little more. I went 71 minutes into another $6K guarantee but only made it about halfway through the field of 2,100. My singular win of the day was in a $9.5K guarantee. I made it to 71st place for an ROI of 136%. So that was nice. It’s three cashes in tournaments between 1,100 and 2,500 players in three weeks. Not big money but not big buy-ins, either. I meant to add this to the end of the last post because it’s an excellent lesson in come-uppance or the turn of the worm or something. Certainly it’s an example of why you have to have the ability to stand back from your game and see how your own setbacks fall into the patterns established by players before you. It had been only a few hours since I’d seen the remarkable self-destruction of the giant stack in the guarantee game and I was in another sub-rung of the EPT Steps competition. I’d had a very lucky triple up early on when three of us drawing four to a straight came up short and my ace kicker paired on the turn. After a few smaller wins I’d doubled up to more than 11K cleaning out three smaller stacks after a J♦ on the river gave me trips. A little up and down around that level and then another pair of jacks got me up to 15,200. The way the Steps Special tournament is structured, there are only 111,000 chips in play among 111 starting players. At the end, those will be spread out among nine players, averaging about 12,333 each. Some players would have more—maybe a lot more—but as long as you have one chip when the player in 10th place is eliminated, you get the Step A ticket. So this is the spot I should have started folding pretty much everything and let the smaller players slug it out, at least until it looked like I might be a little light for a few rounds of blinds. Instead, I gambled on a T♣T♥ and lost 900 above my small blind (300) and ante (50). A little later I went to showdown with K♣T♠ and lost 2,600 extra chips. Tossed 1,200 away with 5♠7♠ (admittedly, I was in 400 for the small blind on that one). Seriously? I was down more than 8K in eleven hands but the blinds had only touched me twice in that time. I was down to 7BB but if I’d looked at the other totals I could probably have still made it through to the winner’s circle. Instead, I went all-in for 4,740 with 5♥Q♥ and lost, going out on the bubble and probably making the stacks under me (there were a couple!) very happy.